M8/M12 Connectors are the defacto standard for sensor connection in industrial machinery and factory automation. The M8/M12 standard is also ideal for applications where a compact, reliable connection system with IP67 environmental protection or extra heat resistance is required. The M8/M12 connectors provide a future-proof interface that supports higher-bandwidth needs, meeting the requirements of up to 10GB/s. Conec offer one of the widest ranges of sensor and actuator overmoulded cordsets with a choice from 3 to 12 contact axial or right angled connectors, with/without LEDs in 2, 3, 4, 5 and 10m assembly lengths. All of the leading BUS protocols are also available. M-style connectors are categorised by the size of the threaded locking nut; these include M8, and M12 connectors. Tough and robust, these waterproof, circular screw connectors are the de-facto standard in the process industry for reliable automated connections: protected to IP67 and Food + Beverage Industry types to IP69K. The M8/M12 standard is also ideal for applications where a compact, reliable connection system with IP67 environmental protection or extra heat resistance is required. M8/M12 connectors provide a future-proof interface that supports higher-bandwidth needs, meeting the requirements of up to 10GB/s. Conec offer one of the widest ranges of sensor and actuator overmoulded cordsets with a choice from 3 to 12 contact axial or right angled connectors, with/without LEDs in 2, 3, 4, 5 and 10m assembly lengths. These assemblies includes, the overmoulded X-Coded male connector. These connectors meet all requirements of IEC 61076-2-109 and electromagnetic compatibility according to CAT 6 A standard up to 500 MHz. In2Connect currently offers various prefabricated cable lengths using mat green PUR cable, RAL6018, with the wire cross-sections 4x2xAWG26. The UL-listed cable has an S/FTP twisted-pair design and is suitable for temperatures in dynamic and static environments from -40°C to + 80°C. All of the leading BUS protocols are also available. Over-moulded metric type connectors improve durability and streamline the size, as well as the appearance, of a cable connection. Over-moulding can also reduce the cost of lifetime ownership of cable assemblies, making it an important consideration for harsh environment applications. The extra strain relief around the wire terminations offers increased durability because the strain relief bonds to the cable jacket. These connectors, available with 3, 4, 5, 6, 8 and 12 contacts provide innovative connection technology fulfilling the requirements of protection class IP 67. The standard programme has moulded versions with anti-vibration locking and they come in various cable lengths and quality. Components with 2 or 3 LEDs are available to indicate operating voltage and/or the switching status. When it gets really tough: Shielded connectors from CONEC protect and bypass weak signals. A uniform cable shielding ensures seamless signal transmission. 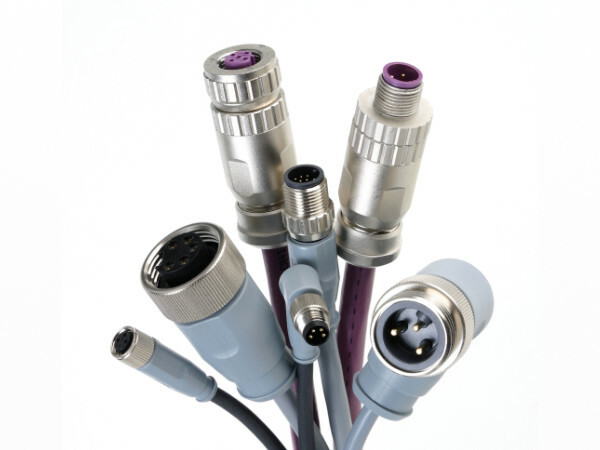 Connection cables with a combination of connectors and/or adapters can be used for nearly any cabling application. M8 and M12 connectors are used in an incredible array of industrial applications like robots, sensors, vision systems, RFID and PLCs, actuators, electric motors, console lights, switches, valves, and contactors, the automotive industry plus machinery and tooling, packaging, factory automation, and food and beverage production areas.